Since the festive seasons of Navratri and Diwali are coming up, I decided to share this piece of Lord Ganesh, that I painted back in 2011. 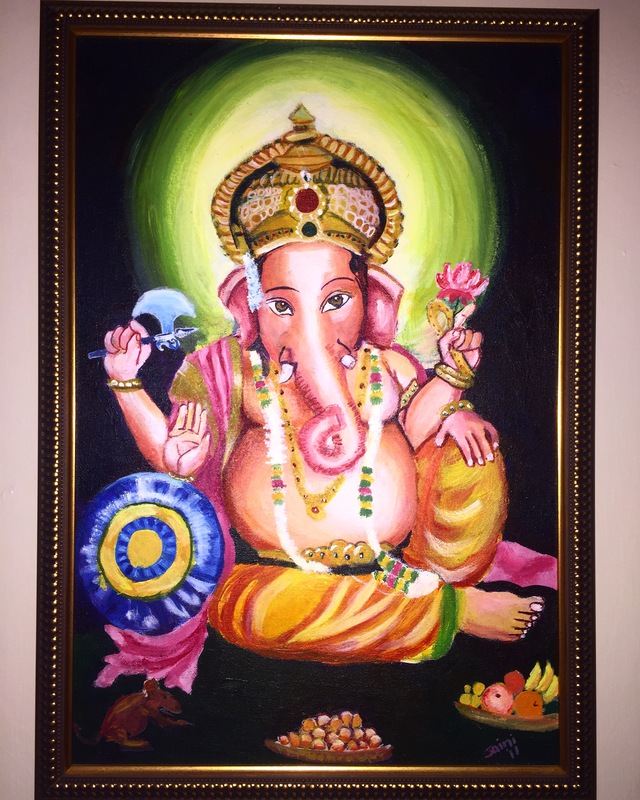 It hangs in our front foyer because it is believed that Lord Ganesh brings good luck into the household. Lord Ganesh, also known as Ganapati and Vinayaka, is a widely-known and most worshipped deity across the Indian culture. He is known as the Lord of Good Fortune who provides prosperity, fortune and success. He is also the Lord of Beginnings, where he is always honored at the start of rituals and ceremonies. Lord Ganesh is widely revered as the Remover of Obstacles of both material and spiritual kinds. Besides, he is also the patron of arts and sciences and the God of Intellect and Wisdom. Lord Ganesh is also invoked as the patron of letters and learning during writing sessions. Lord Ganesh is always seen with his chariot – the mouse (seen at the bottom left) and a plate of laddoos*, which he loves to devour. The intricate jewelry he wears and the other complex details were particularly painstakingly difficult to paint. Overall, this painting exudes a sense of serene calmness that is needed in today’s fast-paced life. What do you think? Lord of Beginnings? Oh! I love.